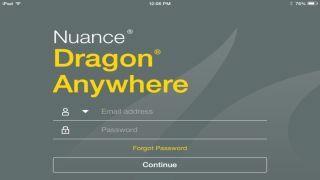 Nuance is ready to take smartphone dictation to the next level through a completely revamped version of its Dragon Anywhere app. First reported by 9to5Mac, the new iOS and Android app is a drastic departure from the original app that extends far beyond the dictation functionality it provides for the built-in keyboard in iOS. The new functionality owes no small debt of thanks to its new status as a completely cloud-based app that means it can take continuous dictation with no time limit and the added level of accuracy allows users to easily write an entire document using the dictation. The entire app works by voice and all navigation can be done without having to so much as touch your iPhone or iPad. Once work is complete it can be synced straight to Dropbox or Evernote where you can then collaborate on editing the document with co-workers or friends. Dragon Anywhere for iOS and Android isn't the only incoming offering. The new Dragon for Mac gets a refreshed look that makes it smaller and much easier to fit onto your busy desktop. Nuance also claims that speech recognition is faster than it once was. Anyone interested in the Mac edition, it costs $200 (around £127, or AU$272) from Nuance's website and that drops down to $100 (around £63.90, or AU$136) if you own the previous edition.